It had been a couple of years since we had visited family in Nebraska and we also haf been invited to a wedding, so we decided to make a trip there for a couple of weeks, including trabel time. We drove instead of flying to save the person paying for our trip some money. Since we wanted to get there quickly and planned to stay at a family member’s house, we opted to leave the RV in storage. To get it prepper for storage, I had to defrost the fridge. I read a little bit on how to defrost a fridge and just went for it. Easy peasy, I thought. It didn’t take long for the freezer start defrosting and I sopped it up as needed. I left a couple things in the fridge that I planned to take and grouped together in the middle. My husband got home and we started packing up the truck to leave. The freezer was mostly dry and I closed it for moving. I grabbed our drinks (for the drive) out of the fridge and closed it. We moved the trailer to storage, locked the rv, then left. If you are clever, observant, or basically not absent minded like me, you would have noticed that I left some stuff in the fridge and closed it. 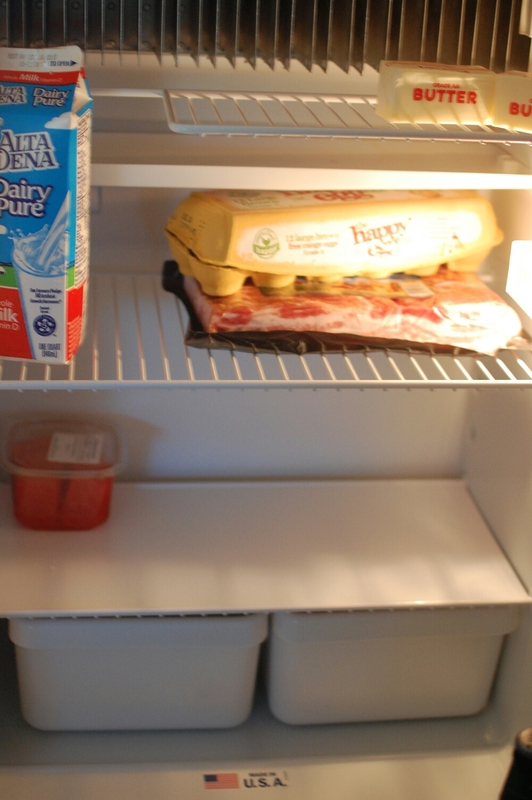 I left food to rot in our fridge for two weeks. Not only did I leave it in there, but I left the fridge damp and sealed. Perfect environment to grow a few things. We return from the trip and hook up to Rocky to tow him to our new spot. We set him up like normal by putting down stabilizers, popping out the sides, and hooking up power and sewage. We turn on the fridge and the air cpnditioning. We go grab dinner and a few groceries to last until we feel up to a longer grocery trip. We get home, open the fridge, then nearly puke. I left milk and crab in the fridge. It was a gut wrenching smell. I am seriously impressed that neither of us puked after smelling that. I check out the freezer and there was only a couple of mold growths in there. The fridge was practically covered in a thin layer of mold. There were little flies flying around in there and even tons of little fly larvae stuck to the sides. It seemed like a lost cause. I wanted to tear out the fridge and throw it away, but clearly not an option. Neither was just ignoring the fridge in hopes that it would go away. My husband told me to wait until tomorrow to clean it. I’m guessing he didn’t want to smell it while I was cleaning it. Instead of cleaning it, I prepped it for cleaning. With ninja-like moves, I swiftly grabed the milk and crab and proceeded to bag them. I tied them tight and stuck them outside, so as to not suffocate anyone within the RV. I grabbed my homemade cleaner and, while holding my breath, aggressively sprayed the entire insides of the fridge. I did that several times that night. I’m not sure if it was actually killing the flies and helping combat the stank, but it sure felt productive. The next day is when I tackled the task of cleaning and sanitizing the fridge. It did seem less stinky and active in the fridge when I looked that morning. I took out all the removable parts and cleaned and sanitized the fridge. It took a lot of effort to locate each larvae and remove it. I feel absolutely disgusting after cleaning everything and even more disgusting using the fridge after seeing the horrific scene that it was merely hours before, but we have to use it. It is properly sanitized, so I just have to get over it. I learned my lesson and that certainly won’t be happening again. I am not alone in being absent minded. My husband joined the club when he was trying to level out the RV after we already had all the stabilizers in place. This resulted in some loud popping noises and now the front stabilizers no longer work. We are assuming it blew the motor on those stabilizers. We are still trying to figure out what to do with that situation. We mostly just hope that 3 weeks from now, when we have to move, that we will be on the top of our RV game. Poor Rocky has been through enough.